Running a small farm or homestead takes a lot of effort, but a world of labor-saving devices out there can make life simpler without consuming fossil fuels. 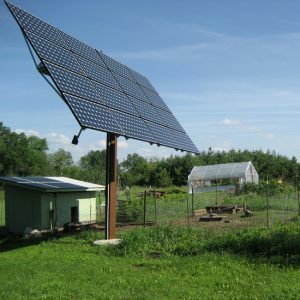 One of the reasons many homesteaders decide to go off-grid is to become independent of a vastly inefficient energy system, and to take greater control of their carbon footprints. Solar, wind, microhydro, biofuels and even human power offer the means to use clean, renewable sources of energy to complete your tasks without having to sacrifice convenience. You don’t have to be an off-gridder to share in the good fortune, either — most everything compiled in the categories here can be used without a commitment to off-grid living. You just may be surprised by how many tools, devices, utensils and implements exist as alternatives to the mainstream, fossil-fuel-powered choices we’re all so accustomed to. Solar photovoltaic prices are dropping by about 10 percent per year, and as the economic and environmental costs of conventional power rise, so, too, does the lure of solar energy. At a current installed cost of less than $3 per watt with a 50-year life span, electricity powered by the sun offers electricity without poles, wires or monthly bills. Portable solar generators. Perfect as a source of emergency electricity and made in sizes from several hundred watts to more than 3,000, portable power stations can provide 120-volt alternating current (AC) and 12-volt direct current (DC) electricity on remote locations in one compact package. Portable solar generators come with one or more PV modules, an inverter and built-in battery storage. For the DIY-inclined, Well WaterBoy Products offers a plan to build your own 160-watt solar cart. Read the full story via Renewable Energy Options for Your Homestead – Renewable Energy – MOTHER EARTH NEWS.